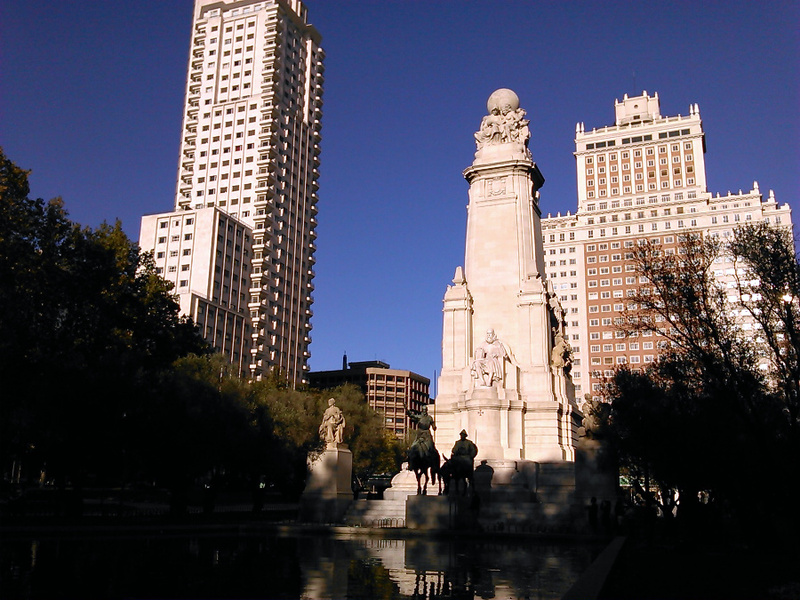 Almost every city in Spain has its own “Plaza de España” (Spain Square). Probably, the most famous is Plaza España of Sevilla, but Madrid has also one of the most touristic ones: In this Plaza de España (Madrid) you will discover the first skyscrapers built in Spain, two beautiful fountains, gardens and in the middle of the square, a statue of Don Quijote and Sancho Panza (Cervantes’s Monument). There is also common to view organized activities in the square, as street markets with food or handicraft objects, or any kind of events. 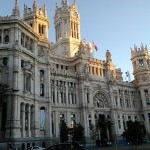 1- In one corner starts Gran Via Avenue , the way to Cibeles Square, Puerta del Sol (Sun Square) and the center of Madrid. 2- In the second corner, there are placed The Royal Palace, El Senado building, Sabatini and Oriente Gardens and Almudena Cathedral. 3- In the third corner there is The West Park (Parque del Oeste) in where it is located The Debod Temple. 4- And finally, in the last corner starts Princesa Avenue, which ends in Moncloa neighborhood and the university zone. To arrive at Plaza de España (Madrid) by metro, you can take Line 3 or Line 10 until Plaza España Station, or Line 1 until Noviciado Station. – Don Quijote and Sancho Panza statues: These statues are on the middle of the square and they are a tribute to the famous writer, Miguel de Cervantes. 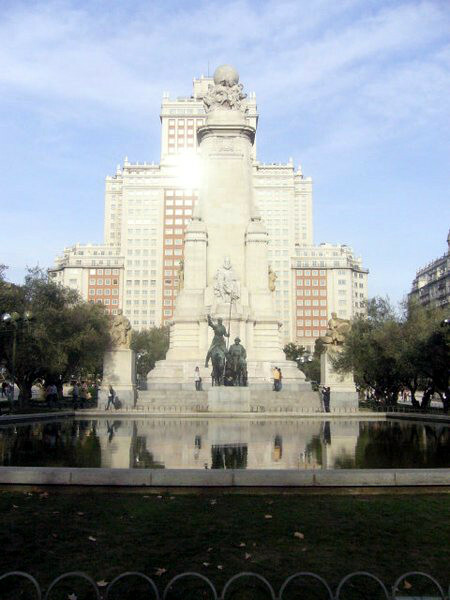 The called Cervantes Monument was built at the beginning of the 20th century and consists in two statues of the fictional characters and an ornamented huge pillar behind them. – The first skyscrapers of Spain: The Spain Building (Edificio España) was built in 1953 and measures 120 metres in height. Then, in 1954 was built Torre Madrid, with measures 142 metres. Finally, there are other relevant buildings bordering the square as Casa Gallardo. 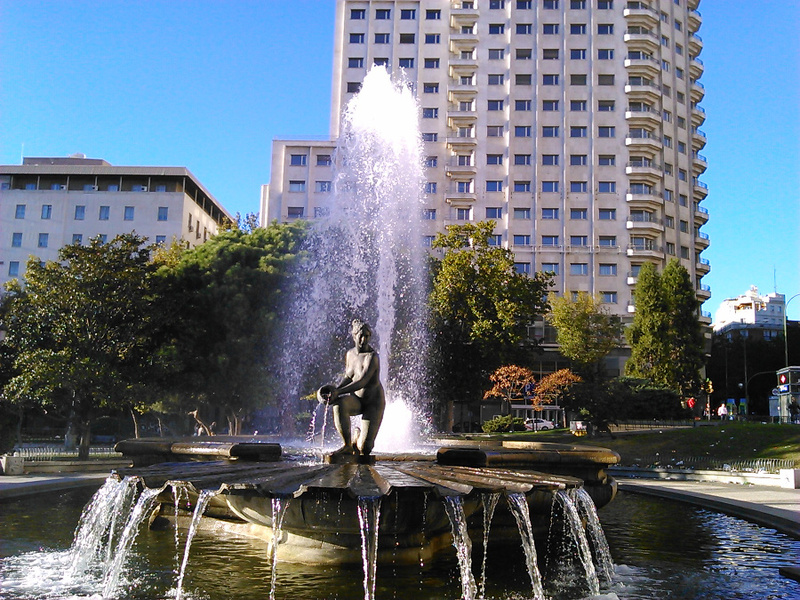 – The fountains, gardens and the surroundings: In our Tour “What to visit in Madrid in one week” it’s explained all the monuments and touristic places that you can visit around Plaza España. If you like Chinese food, it is said that below the fountain (in a commercial passage which leads to the underground parking) is placed one of the most famous Chinese restaurants of Madrid (but take into account that the real Chinese food is not the same food than the Chinese food of most European restaurants 😉 ) If not, you can find all kind of restaurants and cafes in Gran Via Avenue. – Gran via Avenue: Gran Via is one of the most famous streets of Spanish capital. 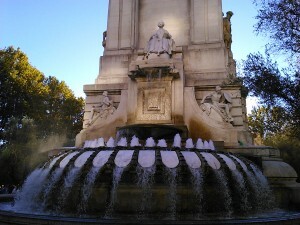 It is situated in the center of Madrid and was built 100 years ago. The idea of the street was to join and improve the communication between the districts of the capital city. – The Royal Palace: Nowadays, the Royal Palace is the official residence of the king of Spain Juan Carlos I, who uses it for important events because the King lives in a small palace called The Zarzuela. The palace was built between 1738 and 1755, and the king Felipe V (1683-1746) ordered its construction. 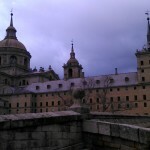 – Catedral de La Almudena (Almudena Cathedral): This is the main cathedral of Madrid. 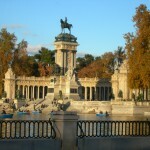 It is placed in front of Palacio Real. – Jardines de Oriente (Oriente Gardens): A square with a beautiful gardens and two rows of statues on this sides. They are placed beside Palacio Real. – Jardines de Sabatini (Sabatini Gardens): These gardens are placed by Real Palace, and also close to El Senado building. – The Debod Temple: It is an old Egyptian temple which is located in Parque del Oeste. Although the temple was once in Egypt, it was disassembled in 1960 and translated to Spain ten years later to avoid its inundation because of the construction of a dam in Egypt. 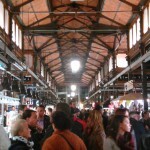 Read also our post with What to visit in Madrid in one week and the Top destinations in Spain.